I saw a lot of good birds this year. In fact, I set a new year list record helped in no large part by a trip to Arizona. Sitting here at the end of the year I can see that I added 33 birds to my life list as well. There won't be many years where I can say that. It is hard to pick my top ten birds of the year. Some are because they were just so beautiful while others were just exciting to find or a long time coming. Eight of the ten were lifers. Starting off at spot number 10 is something a little weird. I saw a lot of partially leucistic birds this year. 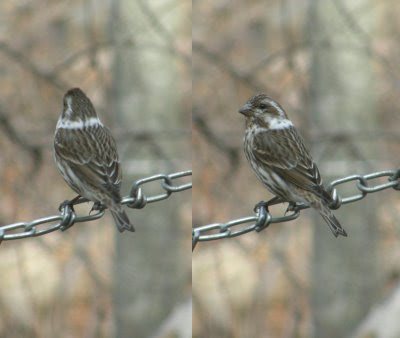 One of my favorites was this female purple finch that had a strange white collar around her neck. It was very distinctive. I wrote a post about it. I wonder if this same bird will show up this winter? That would be really fun. The Eastern Towhee is one of those birds I see most years but they don't stick around and if I miss them in the spring then I've missed out. This spring was one of those years where I didn't see any. Imagine my surprise when I learned one was still hanging out in Minnesota in December. I took part in a Christmas Bird Count this year and got a lead that a towhee was hanging out just a mile or so from where I work I headed out with my camera on the count day and sure enough here was a crazy Eastern Towhee in Minnesota in December. I haven't done a whole lot of twitching in the past. That's running after rare birds for those not familiar with the term. I see reports of strange birds all over the state but I don;t have the time to go running after them. Last winter there was a report of a Varied Thrush just a mile from my house though so with the inlaws in town to help watch my toddler son I grabbed my bins and field guide and made the short drive to the site. I saw the bird from a distance and managed to catch the photo below. Paul and I also talked with Liz Harper who lives on the street where it was hanging out about what it was like to live at the center of birding madness. You can listen on the pilot episode of our podcast. The Sedge Wren was a cool discovery close to home. No travel necessary other than going to work. I took a photography class out on a hike to take landscape shots and a little wren teed up on a tree and chatted at us. I knew it was a wren immediately but something seemed off. It didn't feel like a house wren. I looked closer and was delighted to discover it was a Sedge Wren. I didn't even know they were on the property so it was fun to see them. 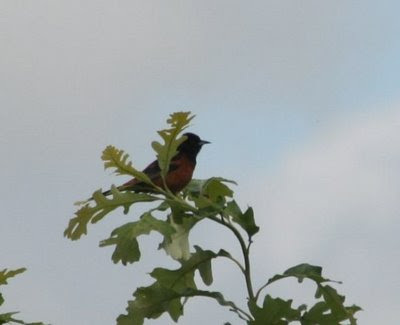 The orchard Oriole made the list because I've been trying to see one for a while and they have eluded me. We get them at work but for some reason I can never find them. I finally stumbled into one in the yard of my wife's grandmother in South Dakota. It was completely unexpected and delightful. Another wren! The Canyon Wren made the list because it was such a fun discovery. I was in Arizona birding unfamiliar habitat looking for unfamiliar birds. I found the Canyon Wren in the Superstition Mountains. It was teed up perfectly on this rock slab and was very cooperative when it came to photos. What a cool bird. Just before seeing the Canyon Wren I spotted a bird teed up in the canyon we were hiking though. It was fun because it was one of those moments where I could feel my birding skills evolving. A few years ago I would have had no idea what this bird was. 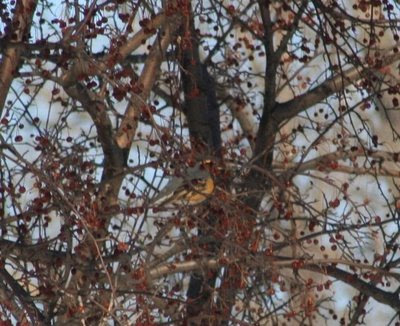 Now though I instantly recognized it as a shrike. I studied it though the bins and then snapped some photos before studying it more. What struck me was that the bill seemed shorter than the bills of the shrikes I'd seen in the winter at home in Minnesota. I double checked the field guide I had with me and sure enough, Loggerhead Shrikes have a shorter bill than Northern Shrikes. It felt good to have not only seen a new species but have correctly made an ID like that in the field. The same hike as the shrike and the wren yielded a handful of other lifers. The most exciting was a Harris Hawk but it technically came after the hike. We were heading back to town when I almost put the rental car in the ditch. I had spotted a large raptor flying in our direction. I rolled down the window and it landed in a saguaro cactus maybe fifty feet from our car. A second then flew in. We could see a nest in the cactus. The birds flew off one by one and I got some decent photos. Even my non-birding wife thought it was pretty cool. I just loved these little guys. This Black-necked stilt was hanging out at the water treatment plant in Gilbert, AZ. These are just gorgeous birds and I could watch them for hours. They are fun to photograph too. Sure, it isn't the rarest bird nor was the adventure to find it the most exciting. I just love this photo though. I took it while on a family reunion trip out to the Black Hills in South Dakota. We stayed at a campground and this little guy was hanging around the whole time we were there. I ended up making him the desktop image for my computer at work. There's something incredible about that blue that just makes me happy every time I see it. This was the same trip where I saw the Orchard Oriole. 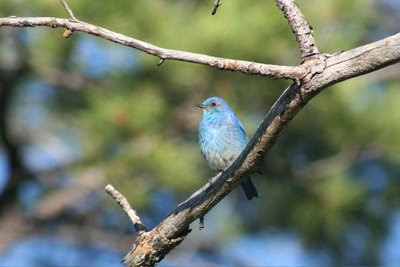 The post I wrote about it won a contest for writing about birding and life listing. The prize was Olivia Gentile's book Life List . If you're interested in listing it is a must read. Well, that's it for 2009. In just a manner of days I'll be back to 0 birds for the year and the adventure begins again.